I wish to relate an incident pertaining to Cedric D'Souza. On knowing that my name was strongly in the wind, Cedric advised me not to accept the offer if made. He told me that things were not going in the right direction, and the affairs were being mismanaged. I doubted his intentions. There was no way I was going to throw in the towel. Cedric, who had attended only one camp in his lifetime back in the mid-70s, was never in my favour. ow my eyes and mind were focussed on the Murugappa Gold Cup in Chennai. I wanted to be in Chennai on the opening day of the competition. I was to collect my air ticket from the IHF office at the National Stadium in Delhi, but it was a frustrating wait. I personally went to the IHF office twice and pleaded, but they were ready to give only a train ticket. Chennai was 2100 km away from Delhi, and a train journey would involve 2 nights and one day. I told Ganesh bluntly that I will not be able to come as the IHF was unwilling to give me an air ticket. The next day I was given a one-way air ticket, with my return to be by train. When I reached Chennai, I was late by a day. I was put up in the Nest International hotel, located very close to the Mayor Radhakrishnan Stadium in Egmore. All other officials such as selectors, technical judges and tournament directors were already there in the hotel. I was surprised to see Col. Balbir Singh there. I learnt that he too was in the running for the chief coach post, and was invited there as another observer. Myself and Balbir did our job thoroughly, observing all the matches and noting down the finer points. All three selectors - triple Olympian Haripal Kaushik, 1975 World Cup hero Ashok Kumar and former national coach Cedric D'Souza - were doing their job with the utmost attention. Also on the panel was Balkar Singh, perhaps due to the fact that he was the Secretary of the Railway Sports Control Board. Ultimately, my name was cleared on July 25, 1998, on the final day of the tournament. I was given preference over Cedric D'Souza, incumbent Vasudevan Bhaskaran and Col. Balbir Singh. However, no IHF official informed me about my selection either orally or in writing. During lemon time of the tournament final between Indian Airlines and Tamil Nadu, a group of journalists approached me for an interview and disclosed the official choice. 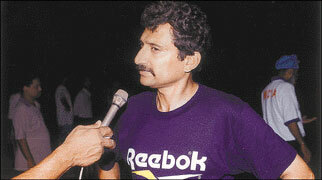 I wish to relate an incident pertaining to Cedric D'Souza that took place before my being appointed the chief coach. On knowing that my name was strongly in the wind, Cedric advised me not to accept the offer if made. He told me that things were not going in the right direction at present, and that the hockey affairs were being mismanaged. I doubted his intentions. There was no way I was going to throw in the towel at this stage. Cedric, who had attended only one camp in his lifetime back in the mid-70s, was never in my favour. During our return journey by the Tamil Nadu Express, Haripal unwittingly threw another surprise. He said that Cedric had persuaded him to be the national coach! Even before my name was confirmed, I requested C. R. Kumar to give me video cassettes of the matches of the experimental team he had taken to the 1997 Panasonic Masters Tournament held in Hamburg, Germany. Kumar told me he had given them to Cedric. I rang up Cedric who assured me that he would give them to me on the off day of the Murugappa tournament. I cancelled my sight-seeing programme for that day with IHF treasurer J. N. Tyagi and stayed put in my room. To my utter disappointment, Cedric never gave me the cassettes. Once later I again reminded him of my request, but he dilly-dallied on that issue. Till date, I am yet to see the cassettes.